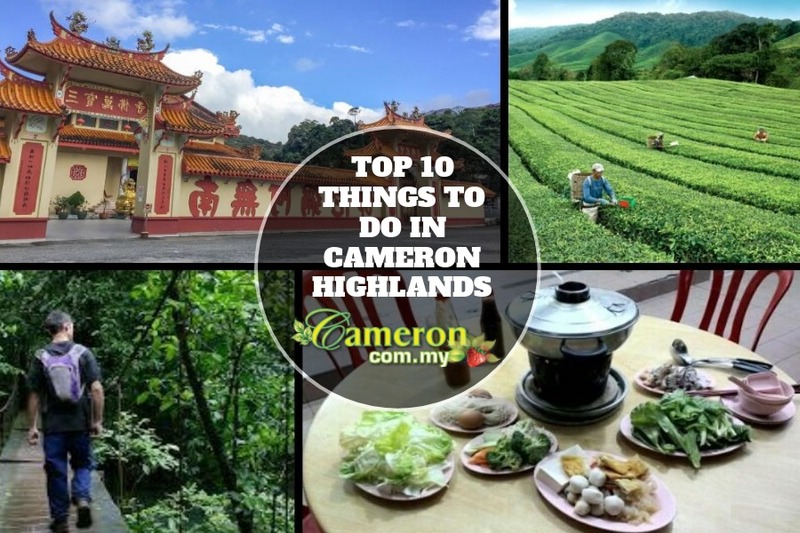 With a land area encompassing 71,000 hectares within the cool and pristine natural air, Cameron Highlands is one of the top tourist destinations in Malaysia. There are so much you can do here, you will need to come back for more if you are to see everything Cameron Highlands has to offer. Here are 10 things you can do, for a start. This brand is synonymous with Cameron Highlands. Visiting the Boh Tea Plantations is a ‘must do’ which operates 3 tea plantations namely the Habu Tea Garden, the Sungai Palas Tea Garden and the Fairlie Tea Garden respectively. Learn about how far Boh Tea has come since 1929 and how the best-selling tea brand in Malaysia is made which has already built a strong brand name across the world. As a natural highland resort, you can enjoy the hilly terrains and beautiful tracks to appreciate the wonders of nature here. From casual strolls to highly-challenging tracks, you can go through various difficulty levels marked from 1 to 10 like Gunung Beremban and Gunung Brinchang. You can start by taking Track 5 that goes through the Malaysian Agriculture Research and Development Institution but inform the local guide or offices before venturing while bringing with you sufficient equipment like torchlights and drinking water. Coming to Cameron Highlands means you would have known that this place is known for its fruit and vegetable farms. From Ringlet to Brinchang, Trinkap to Kuala Terla, there are countless farms for you to visit and experience how vegetables and fruits like strawberries are planted. Enjoy fresh strawberry ice-cream and produce or to Blue Valley, Bertam Valley and Kampung Raja to see how flowers are produced. In many ways, taking fresh seafood dishes might be quite unorthodox but when you are in Cameron Highlands, you must try this unique hot-pot cuisine. One thing for sure, you get the freshest vegetables while you can dip meat and other seafood in your choice of Tom Yam or Herbal soup. Besides being a tourist destination, there is a rich culture and religious community here. Visit the Sam Poh Buddhist Temple in Brinchang where you get some breath-taking views of the surroundings or the Sri Thanduyathapani Swamy temple, a common place of worship among the Hindus here. Visiting markets will give you a localized perception of the culture and daily living practices here. You can visit the morning market located in Kea Farm which starts around 8.00am each day or the infamous Pasar Malam (night market) located in Brinchang which usually starts from 3.00pm to buy the freshest products, crafts and souvenirs. Besides plantations, you can visit the many butterfly farms located around Cameron Highlands. One of the popular ones is located in Kea Farm, which is about 5 minutes drive from Brinchang town. For a nominal fee between RM2 and RM5, you get to enjoy a guided tour and watch some free-flying butterflies. Another insect breeding farm that might interest here are bees. There are a few bee farms located around Trinkgap, Kea Farm and Ringlet where you get to check out how honey is made and how bees produce them. You can buy fresh honey here at the shops and other related items. If you are a nature-love, you will like the beautiful waterfalls within the mountains and hilly terrains. Take time to visit the Lata Iskandar waterfalls, one of the most popular tourist spots here or head out for trekking towards the Robinson or Parit Falls. As the name implies, Cactus Valley offers you a great spot to learn about this mysterious plant. Some dating as old as 60 years, you can see all types of cactuses here while there are other vegetation like apple trees, passion fruit and flowers, all of which are grown within the hillslope and beautiful surroundings of Cameron Highlands. Created in 1990 this park is definitely a wonderful place to visit. Pick up a pamphlet at the entrance and learn about the amazing way fruits and vegetables are grown. This farm is very well organized and great to show you how fruits and vegetables are cultivated. There are beautiful hanging flowers throughout the farm that are very lovely. They have an amazing edible plant site where you can see fruits and vegetables that you can eat and try for the first time. At Agro Technology park in MARDI you can purchase produce much cheaper than you can at other farms. You will see beautiful flowers that are grown, especially beautiful roses. You can also view the process of how tea is made from the grinding of tea leaves. There is also some awesome Jungle Trekking activities that you will want to hike. Make sure that you visit the fruit tasting corner as well where you can taste some of the freshest fruits in Cameron Highlands. This is definitely an attraction of Malaysia that you do not want to miss. You will definitely be very pleasantly surprised by the amazing abundance of herbs, flowers, and produce as well as the wonderful hikes available.